This image depicts the catastrophic collision of two planetary bodies similar in composition that led to the formation of the Earth and its moon 4.5 billion years ago. The formation of the moon has long remained a mystery, but new studies support the theory that the moon was formed from debris left from a collision between the newborn Earth and a Mars-size rock, with a veneer of meteorites coating both afterward. Earth was born about 4.5 billion years ago, and scientists think the moon arose a short time later. The leading explanation for the moon's origin, known as the Giant Impact Hypothesis, was first proposed in the 1970s. It suggests the moon resulted from the collision of two protoplanets, or embryonic worlds. One of those was the just-forming Earth, and the other was a Mars-size object called Theia. The moon then coalesced from the debris. "In terms of composition, the Earth and moon are almost twins, their compositions differing by at most few parts in a million," study lead author Alessandra Mastrobuono-Battisti, an astrophysicist at the Israel Institute of Technology in Haifa, told Space.com. "This contradiction has cast a long shadow on the giant-impact model." The scientists found that within 100 million to 200 million years after the models began, each simulation typically produced three to four rocky planets, with the largest comparable to Earth's mass. These worlds often were composed of material that was distinct from one another. However, they also found that 20 to 40 percent of the time, the composition of one planet was very similar to the makeup of the last protoplanet that had collided with it. This likelihood is about 10 times higher than previous estimates. "The most exciting and surprising thing was to find out that we can shed new light on a 30-year-old mystery," study co-author Hagai Perets, an astrophysicist at the Israel Institute of Technology in Haifa, told Space.com. "Compositionally similar planet-impactor pairs are not rare at all." The reason for this similarity in composition has to do with the orbits occupied by these colliding bodies. The composition of these objects varied with the amount of heat they received — for instance, the farther away a protoplanet was from the sun, the colder it was, and therefore the more likely it was to retain a relatively heavy isotope of oxygen. The scientists found that as each planet assembled, the last protoplanet to collide with it probably shared a similar orbit. Thus, protoplanets that share similar birthplaces can also share a similar composition. 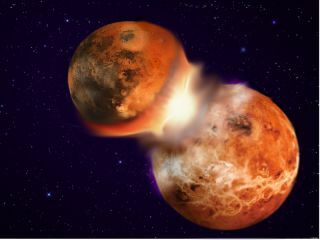 This finding suggests that the similar compositions of the Earth and moon could be a natural consequence of a giant impact. This theory also explains why their compositions differ from that of other bodies in the solar system, the researchers say. Mastrobuono-Battisti, Perets and their colleague Sean Raymond, of the University of Bordeaux in France, detailed their findings in the April 9 issue of the journal Nature. This NASA image depicts the moon as it coalesced from debris created when a Mars-size object slammed into the early Earth. Another challenge to understanding how the moon and Earth were formed has to do with tungsten. This metal has highly siderophile characteristics, meaning it binds tightly with iron, and it would have a strong tendency to move into Earth's iron-rich core. However, Earth's crust and mantle have an excess of siderophile elements such as tungsten. Prior research suggests that the iron-loving elements now seen on Earth come mainly from a "late veneer" of material from space that accumulated both after the giant, moon-forming impact and after Earth's core formed. If this theory is true, then Earth's tungsten isotope levels should be different from those found on the moon. Now another two independent studies reveal there is indeed this predicted difference between the amount of tungsten isotopes on Earth and on the moon. Scientists analyzing lunar rocks discovered an excess in the abundance of the isotope tungsten-182 on the moon compared with the present-day Earth's mantle. "It is the first time that we can resolve such a small difference," cosmochemist Thomas Kruijer at the University of Münster in Germany, lead author of one of the two studies, told Space.com. "Defining this value precisely is a very important step forward." This difference is best explained by the theory that differing proportions of tungsten-182 each accumulated after the giant moon-forming impact, the researchers say. "Our results provide independent evidence for the late-veneer hypothesis," Kruijer said. The research in these two studies was also detailed in the April 9 issue of the journal Nature.